Around the time The Mist movie came out, I decided to pick up Stephen King’s short story book Skeleton Crew. I got through The Mist and then read the next story Here There By Tygers before putting the book down for quite a while. Well, thanks to my commute, I’ve got a lot more time to read and decided to pick Skeleton Crew back up. I read The Monkey yesterday during the trip and it was pretty good, though it definitely felt like I had seen this kind of story before (though, never read it). It’s your basic “killer/crazy toy/doll story.” The main difference is that, the way King tells the story, I was constantly wondering if Hal, the main character, was crazy or if these things were really happening. The story is that Hal and his family go to his aunt’s house to clean it out after she dies and he finds the toy monkey that terrorized him as a kid and that he also threw down a well as a child. Only Hal ever heard the monkey clang his cymbals together and its voice in his head threatening to kill him and his family members. The thing is, though, that the monkey tends to be right on the money. As an adult, Hal’s boys find the monkey and he’s worried that the cycle will start over again. Like I said, the story feels very familiar and I wasn’t sure if Hal was crazy until it turned out that one of his sons hears the same things in his head too. After that, the end is pretty intense and worth the nearly 40 pages of story. It’s not the best thing of King’s I’ve read or even the best thing in this book (The Mist was awesome), but I’m hoping that the stories will only get better from here. My main complaint with the story would be that it feels overly long and may have a little too much packed in. I get that King wants me to think Hal’s crazy because he lost his job and knocks his other son around a bit and his wife pops pills, but it just felt a bit long for what it was considering I was just waiting for the finale the whole time. Kinda like watching Bullit all over again. 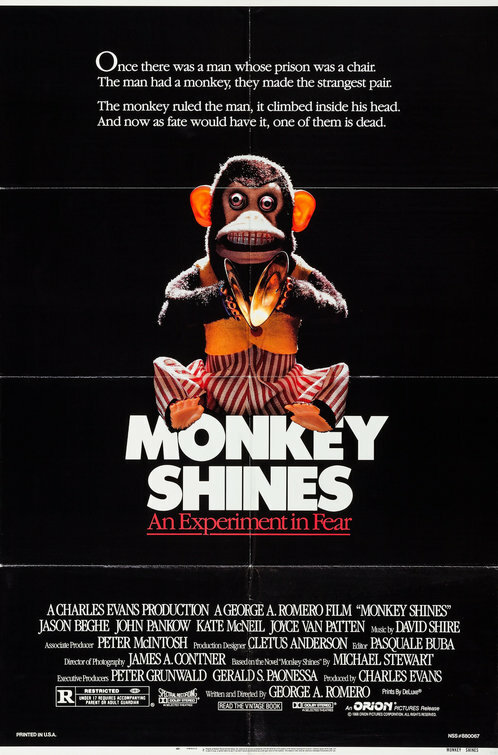 Oh, also, I thought that the movie Monkey Shines was based on this story because of the poster, but Alex tells me it’s not. Apparently the movie has a real monkey. Who knew? ← Lords of Dogtown (2005) … Is Awesome!